The Hialeah City Council gave final approval to two new transit-oriented development areas on Oct. 25, with about 313 acres zoned for more density and uses that promote both pedestrian traffic and public transportation. The city hopes the rezoning will transform the heavily industrial area around its two Tri-Rail stations into mixed-use communities with housing for workers and vibrant open spaces. 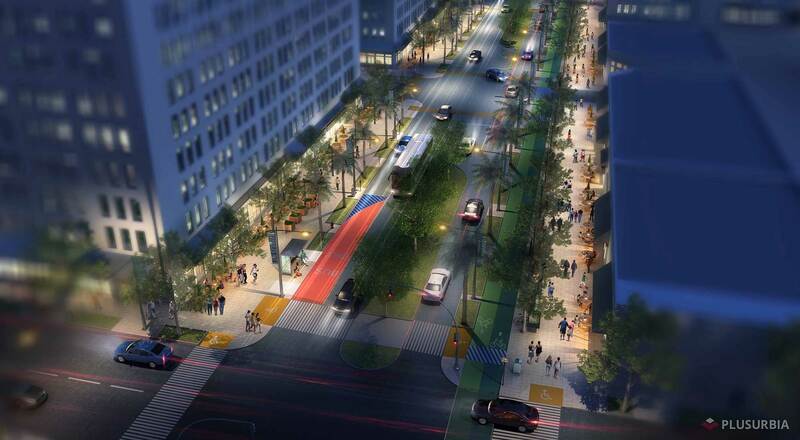 Miami-based PlusUrbia, firm that designed the neighborhood plan in Miami’s Wynwood as it has gone from industrial to mixed use, also crafted the TOD and complete streets plan for Hialeah. The rezoning centers around Hialeah Market Station, at 1200 S.E. 11th Ave. – with a Tri-Rail station only one stop north of the station that connects with Miami International Airport – and Tri-Rail/Metrorail Transfer Station, at 1125 E. 25th St., where both systems connect. The Metrorail line continues south to the Health District, downtown Miami, Coral Gables and Dadeland. The Tri-Rail line extends north into Broward and Palm Beach counties. There’s also an Amtrak station nearby that carries passengers to New York. Multiple transit-orient developments have been proposed at the Metrorail stations further south, with apartments, hotels and offices, so local developers have bought into the TOD concept. Unlike Wynwood, which had an influx of artists, restaurants and retail before the city rezoned it, this area of Hialeah hasn’t seen much economic activity outside of warehousing in recent years. The question is whether the city can generate developer and resident interest in the new TODs. At least one developer is willing to try. The TOD process at Market Station started several years ago when Gerard Keating, who owns about 20 acres in the area, hired Zyscovich Architects to create a zoning plan for the area and present it to the city. He hoped that this plan would give his property greater density so he could build a mixed-use project. Hialeah officials weren’t ready to approve the plan at the time. So the city hired PlusUrbia to work with its planning and zoning officials and create a TOD and complete streets plan for both Market Station and Transfer Station. The new zoning applies to areas of 142 and 171 acres, respectively. Maria Bendfeldt, the project designer at PlusUrbia, said the TOD zoning encourages developers to create open space, public amenities and improve pedestrian right-of-ways in exchange for greater height. The goal is to have community gathering spaces, wide sidewalks and bike paths, and decorative medians. In some cases, pedestrians and cars would share the streets. The areas of each TOD are divided into three density levels: high-rise, mid-rise and low-rise. The high-rise areas are zoned 125 units per acre and up to 12 stories, if developers purchase an additional three stories of height. However, directly along the train tracks, developers could build up to 15 stories. The mid-rise areas are zoned for a minimum of 25 units per acre up to 125 units per acre and up to eight stories, with the purchase of three additional stories. Finally, the low-rise areas are zoned for up to 35 units per acre and no more than three stories. In the Market Station area, the high-rise zoning runs down Southeast Ninth Terrace and Southeast 10th Court from Southeast Eighth Street to Southeast 14th Street. In the Transfer Station area, the high-rise area is along East 25th Street between East Eighth Avenue and Northwest 37th Avenue, plus along East 11th Avenue from East 28th Street to East 23rd Street. Bendfeldt said that all buildings must have ground-floor retail to activate the street. Other types of commercial development would also be permitted in the buildings, she added. PlusUrbia worked with the city to reduce parking requirements for the area to encourage public transit and make the units more affordable, Bendfeldt said. The TOD zoning requires one space for each one-bedroom unit, generally under 650 square feet, and 1.5 spaces for larger units. However, the developer could reduce the parking requirement by a half-space per unit by paying into a TOD area parking fund. Bendfeldt said the city hopes to use these funds to build a public garage at some point. Bendfeldt said the new TODs are ideal locations for workforce housing because of their access to public transit that reaches major employment centers. There aren’t many affordable options left in the county, especially for young workers, she said. “As soon as you get two or three catalyst projects, you will get more interest in the area, either people trying to retrofit existing structures or building something new,” she said.